This module can be a necessary addition to the Modular Preamplifier Control Center when more than two sources need to be connected to the preamplifier chain. Four high level inputs can be selected by means of SW1 and routed to the output. The output of this module must be connected by a suitable cable to one of the two inputs of the Control Center module. In this way, a total of five inputs will be available to the user of this module combination. The Switching Control features also the so called "Double Bar", i.e. the possibility of routing to an external unit, e.g. 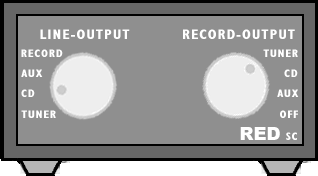 a recorder (tape or digital) an input signal different from that reproduced at the time by the amplifier. 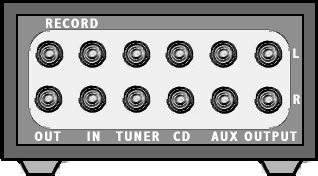 For example, you can listen in to a CD whereas the signal coming from a radio station through the Tuner is routed to the recorder. This selection is operated by means of SW2. The circuit diagram shows the Left channel only, so all the parts must be doubled except SW1 and SW2 which are double pole switches, i.e. ready for stereo.